Review: "Vanishing Time" is a must-see movie. Considering such promises of other critics disappointment is almost a sure thing. But even though this fantasy drama might happen to come across a few bumps in the road you simply have to praise the richness of ideas when it comes to the different themes implemented as well as the story in general. We don't just get shallow fantasy as a fundament for love that lasts for decades, but also a thought-provoking plot in which different elements are subtly interwoven with one another and there is even left room for different interpretations. However, if you prefer your movie with a clear ending you can take "Vanishing Time" just the way we get to see things on screen. In other words, this movie proves that there are after all still innovative movies coming out of Korea. 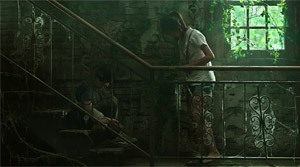 It is truely amazing what director Eom Tae-hwa manages to achieve in his debut work. 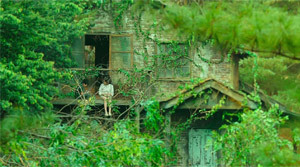 In terms of the story as well as the visually appealing and dreamy pictures. But particularly concerning the main atmosphere. Eom Tae-hwa has already been part of the directing department for movies like "Epitaph" and Park Chan-wook's "Sympathy for Lady Vengeance". Two movies with oustanding visual expressiveness. And one parallel to latter movie, in which a sled with a disturbing being is pulled through the snow, is a child pulling a boy through the air like a balloon. In fact, "Vanishing Time" oftentimes seems like a surreal painting which opens a door to a world of magic, and yet the drama is very strongly grounded in reality as well. Accordingly, the story can be quite dark at times, too. To understand this contrast you have to keep in mind that two worlds are put against each other here: the world of adults and that of children. Because of their innocence children still see the magic of this world and it's this child that's still inside the grown-up Seong-min. Then again, you might wonder why, despite the stopping of time, the story is grounded very much in reality. 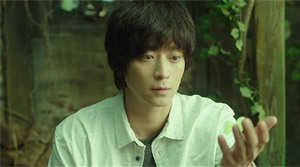 In the end, we get to see the events also from the perspective of adults and in their mind Seong-min isn't a boy who has aged several years, but is still connected to Soo-rin through his innocent love for her. For them he is a pedophiliac child murderer. Understandably this shifts the film's tone into a darker realm as well, making some scenes between the adult man and the thirteen-year old girl in fact seem rather disturbing. It's actually possible to watch the movie from a completely down-to-earth perspective, meaning that Soo-rin is just imagining everything, which wouldn't be a surprise with her vivid imagination, and that a pedophiliac killer simply makes use of this. However, that's not what the director is aiming for. Instead, Eom opens up a world of fantasy and freedom, which is denied to us since exiting childhood. This is reflected in the picture's enchanting atmosphere, which, also thanks to a good score, takes us into a different, magical dimension. The actors also deserve some praise. Sin Eun-soo impresses in her first role formadably and she shares great chemistry with Gang Dong-won ("Master", "The Priests"). Therefore, we feel captivated by their innocent love, which transcends time and dimensions, as well as feel unwell when both of them hold hands. Seong-min is still a scared child, though, which isn't surprising since he has lived isolated from humans for years. What influence being captured in a time bubble has on your psyche isn't shed light on the way it would have been desireable and of course we also happen to come across a few plot holes, at least those who have dealt with the subject of time on a scientific basis. Yet, we get to see some impressive and innovative special effects. And there is also some food for thought: not just concerning the subject of time, but most importantly childhood and adulthood and the world in between. That's just what "Vanishing Time" is all about. A movie about the contrast between two worlds, so to speak the blindness towards the fantastic realm during adulthood - in the spirit of Clemens Brentano and Novalis of the Romantic era. For this I give a clear thumbs-up!